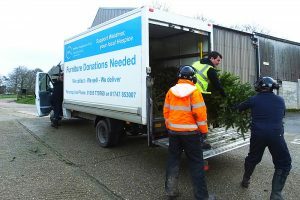 Weldmar Hospicecare, the end of life care charity based in Dorset, operated a Christmas tree recycling scheme in January 2018. The charity collected and recycled trees from supporters in Dorchester, Weymouth and Portland in exchange for a donation to help Weldmar continue their care – raising over £4,500. Clair Walker, Weldmar’s Major Events Fundraiser, organised the collections. Clair said “It’s the first year we have carried out this scheme, and I was really pleased with the response. Thanks to the generosity of the people in Weymouth, Portland and Dorchester areas, we have raised an amazing £4,500 for Weldmar Hospicecare and collected over 350 trees. I would like to thank all those who helped with the collections – Dorset Vehicle Rentals for loaning us a vehicle, our own volunteers, and volunteers from Magna Housing and Acorn to Oak Tree Services for braving the cold weather. I would also like to thank the team at Kingston Maurward for chipping all of the trees, which was a massive task!”. Weldmar Hospicecare is a charity that provides end of life care for people living in Dorset who need specialist support. Their compassionate approach supports patients and their families, medically and in other ways, in the community, in their hospice and at home. All their care is free and reliant on public donations.